Gretchen Egolf as Amanda takes a bite out of Christopher Innvar (Elyot) in Private Lives at Barrington Stage Company. All photos by Kevin Sprague. Amanda and Elyot enjoy their reunion in Private Lives at Barrington Stage. 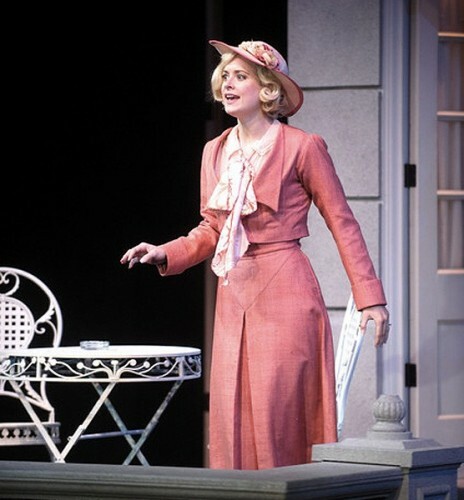 Gretchen Egolf is a perfect Amanda Prynne in Private Lives at Barrington Stage Company. 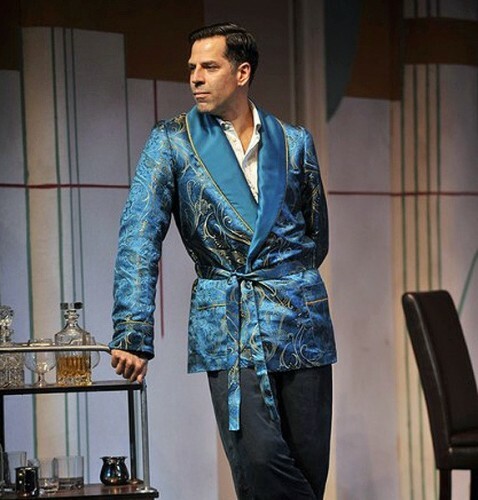 Christopher Innvar is the totally irresistible Elyot in Private Lives at Barrington Stage Company. 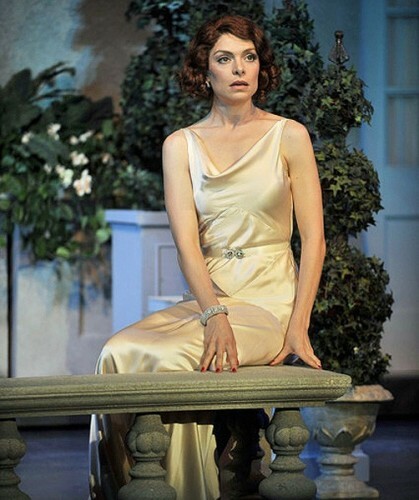 Rebecca Brooksher is a gloriously beautiful Sibyl in Private Lives at Barrington Stage Company. 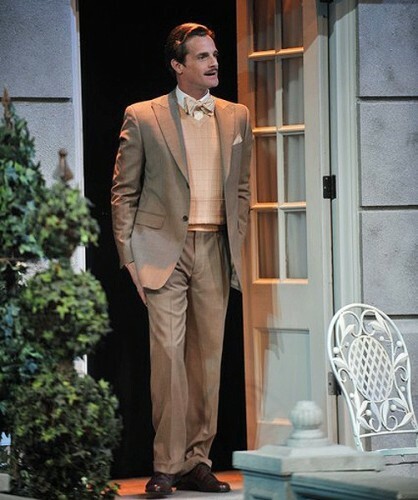 Mark H. Dodd makes a delightfully dashing Victor Prynne in Private Lives at Barrington Stage Company. 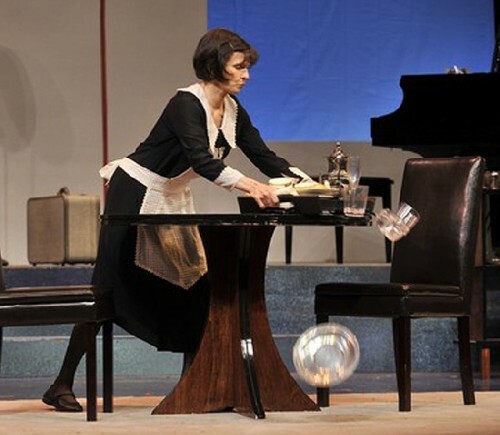 Tandy Cronyn sends more plates crashing to the floor as the French Maid, Louise, in Private Lives. Abandoned on their wedding night, Rebecca Brooksher as Sibyl and Mark H. Dodd as Victor in Private Lives. When the four spouses meet again, all hell is breaking loose in Private Lives at Barrington Stage Company. All photos by Kevin Sprague. 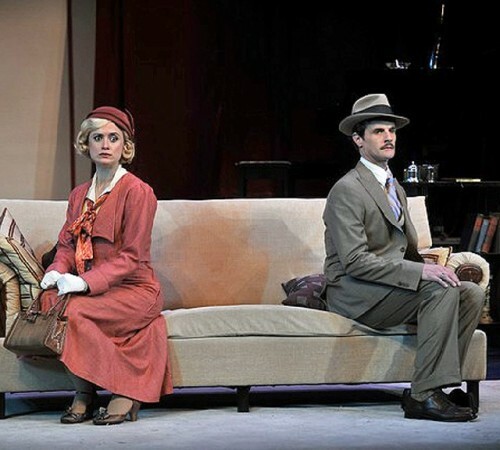 Gretchen Egold and christopher Innvar in Private Lives and Barrington Stage Company. Private Lives by NoÃ«l Coward; Directed by Julianne Boyd; Cast: Rebecca Brooksher (Sibyl), Christopher Innvar (Elyot), Mark H. Dodd (Victor), Gretchen Egolf (Amanda) and Tandy Cronyn (Louise). Scenic Design, Karl Eigsti, Costume Design, Elizabeth Flauto, Lighting Design Matt O'Hare, Associate Scenic Designer, Brian Prather, Press Representative, Charlie Siedenburg, Casting, Pat McCorkle CSA, Music Director, Brian Usifer, Fight Choregrapher, Michael Burnet, Choreographer, Darrell Pucciarello, Production Stage Manager, Renee Lutz. Barrington Stage Company, 30 Union Street, Pittsfield. Running Time 2 hours, 20 minutes. Through August 24. "I think very few people are completely normal really, deep down in their private lives. It all depends on a combination of circumstances. If all the various cosmic thingummys fuse at the same moment, and the right spark is struck, there's no knowing what one mightn't do. That was the trouble with Elyot and me, we were like two violent acids bubbling about in a nasty little matrimonial bottle. " One or two lifetimes ago, there was something called "sophisticated humor," a peculiar sort of repartee that relied on two or more equally quick minds to make it work. NoÃ«l Coward, the English bon vivant, was the ultimate master of it. His genius simply saturates every moment of this delectable comedy. Private Lives positively overflows with his brainy brand of joyous joshing. The art of the swift, pithy retort, the bon mot, the zinger is slowly passing from use, with potty humor and non sequiturs becoming a substitute for real humor. Lately, you are more likely to hear something stupid said in response to a clever line rather than an inspired riposte. Just watch how modern comedians work, eliciting more applause than real laughter. Authentic comedy has become the endangered species of commercial entertainment. But certainly not in the Berkshires where we are enjoying a bountiful summer of farce and real comedy. If you haven't deduced it by now, this Private Lives is an almost perfect production of a timeless treat. Artistic Director Julianne Boyd captures the carefree mood and ebullient spirit of a bygone time with panache. From start to finish, she keeps the action on stage going at breakneck speed. In this rendering, the dialog is more a series of witty quips, not weighty quotes, and if you miss one because the audience is still laughing, well, there is yet another coming right along. Few theatre-goers are unfamiliar with NoÃ«l Coward's masterpiece, it tells the story of two divorcÃ©es Elyot Chase and Amanda Prynne, who bump into one another on their second honeymoon only to end up ditching their new spouses - Victor and Sibyl. Reunited after five years, the old flame is reignited, and they return to Paris to revisit their old passions and also awaken their previous feuds. Behaving playfully is what Elyot and Amanda do best, though the jocularity always seems to end in a squabble. As played by Christopher Innvar (Elyot) and Gretchen Egolf (Amanda) their satirical portrayal of the English leisure class between the two world wars is spot on. They have captured the insouciance of the times perfectly. With childlike abandon, they enjoy every moment of life, unbothered by the great depression looming over the western world, or the broken hearts they left behind on the balcony of their honeymoon hotel. Left stranded, their marriages unconsummated, are their respective bride and groom. Rebecca Brooksher, making her BSC debut as Sybil and Mark H. Dodd as Victor are appropriately flabbergasted. Though left high and dry, they rise to the challenge by following their headstrong and impulsive partners to Paris in order to find out why. End of Act One. All of this leads to a hysterical confrontation in which the reunited couple are able to harvest bales of laughter as love turns to hate, and turns around again when feigned indifference turns to caring. The fight between Amanda and Elyot at the end of the second act finds the dishes, the furniture and the actors all careening across the stage as all hell breaks loose. It is a scene of absolute lunacy unmatched in my memory of theatre in the Berkshires. In the midst of the uproar the doors fly open to reveal the stunned Sibyl and Victor who watch, speechless, as their partners decimate their relationship with acid comments, flying objects and total mayhem. End of Act Two. During the pause, under dimmed lights, a small contingent of prop people dressed as maids and butlers clean up the clutter, and reset the stage for the final act in which resolution is finally achieved. The earlier effervescence is replaced with bitter remorse and recriminations, but instead of pouring gasoline on the rage, the unhappy pair manage to declare a truce, even as we see their abandoned spouses come to their own surprising resolution. The fifth character in the play, Louise, the French speaking maid is played with great finesse and perfect comic timing by Tandy Cronyn. As she prepares to serve the four their breakfast, she clears the table with a sweep of her hand, sending the china clattering to the floor once again. It is a priceless moment that could be titled "The Revenge of the Maid." In the hands of Barrington's well chosen actors, Private Lives is a joyous ride from start to finish, delivering its cargo of jokes and japes with aplomb, as if someone shook up a bottle of pop and then took the cap off. The sets, costumes, lights and sound were about right, not drawing too much attention to themselves. The staging elements all supported what was happening on stage, with the possible exception of a billowing curtain behind the piano which needs to be tamed. The apartment is in need of redecoration as well. The show zips right along, and before you know it, it is over. If there is any complaint to be made, it is that the fun could not go on forever. Still, have hope. Another Coward show is opening later this week in Stockbridge, and the Berkshires will have two NoÃ«l Coward offerings on stage at the same time. Private Lives is the right play for these troubled times, an escape into a delectable world of taste and refinement that we may never see again. It is the cherry on top of Barrington Stage Company's 2008 main stage season. This is one dessert you want to say "yes" to.